Get your SAP® system operating at peak performance. After partnering with SAP for over 20 years, Esker has the knowledge and expertise that customers using SAP want and need. Esker's automation solutions have SAP-certified integration, which ensures a smooth flow of business information through SAP software using a single, integrated point of support. Whether your business is upgrading or starting fresh, or whether you’re using the on-premises (S/4HANA), private cloud (S/4HANA Enterprise Cloud) or public cloud (S/4HANA Cloud) version, Esker is here to help. By automating all steps in the O2C and P2P cycles, all of the appropriate business leaders, team members, customers, and suppliers can rapidly and efficiently exchange information, eliminating any process holdups. Automate O2C and P2P processes directly in your SAP system. Integrating Esker's order-to-cash and purchase-to-pay solutions with SAP business systems brings automation to every phase of processing. Automatically receive and enter supplier invoices, while gaining 100% visibility during routing and tracking — all within your SAP system. Esker captures the invoices, reads and processes them according to rules built into the platform, and creates the invoice in SAP FI. Receive, process and route orders to staff for electronic validation while giving management full visibility into order statuses before they enter SAP. Orders are automatically archived in Esker, your in-house SAP content server or any existing archive, and linked back into SAP. 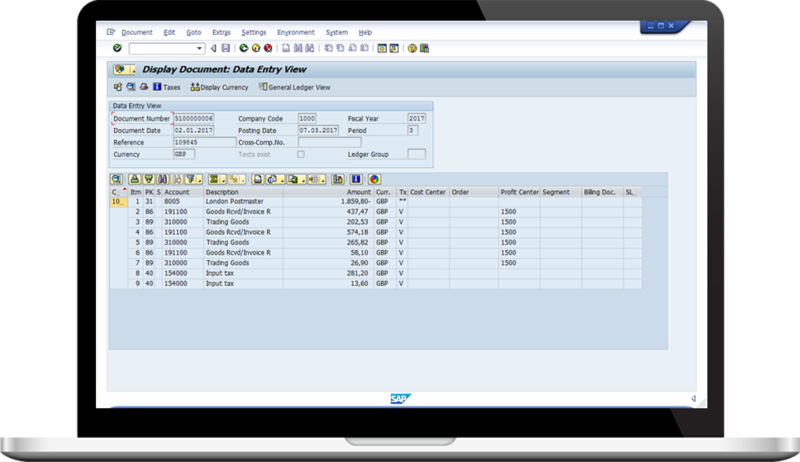 Automate your indirect spend requisition process and automatically create resulting orders and good receipts in SAP. Turn non-PO invoices into PO-like invoices and accelerate your financial close procedures. Enhance SAP efficiency during document delivery. Cloud Fax Services for SAP Send or receive a fax directly from/into SAP with Esker's fully integrated solution. Documents are submitted from SAP and sent to an Esker production facility where they are processed and faxed per user specifications. SAP Business ByDesign customers benefit from all the advantages of Esker Cloud Fax Services. Rather than printing on a local printer and sending documents from a fax machine, users can fax directly from SAP Business ByDesign. Mail Services for SAP Send postal mail as a service directly from SAP to an Esker production facility, where it is printed, folded, stamped and handed off to the postal service within 24 hours of creation. Once handed off, a mail status is fed into SAP, updated in real time and made visible. Instead of printing on a local printer, any document created from SAP Business ByDesign is sent through a virtual printer. Esker Mail Services is SAP’s first solution partner for online postal mail services. Fax Server for SAPEsker offers a connector for SAP applications that allows the sending and receiving of business documents directly from and into SAP Workstations. Documents can be routed to users, directly to SAP application modules, or archived for later use. The SAP interface manages status notifications that are sent back to the SAP system. The SAP integration capability developed by Esker brings together four key components to offer more flexibility than any other document delivery solution available in the SAP space. The traditional interface for fax, email and wireless message communications from SAP applications. Provides full routing of documents directly from SAP into Esker solutions, as well as full status of delivered jobs back into the SAP system. Allows the Esker Business Rules Engine to lookup business partner delivery information in the SAP Vendor Master and Customer Master records. Allows industry-standard data to be passed in and out of SAP applications, including data “extracted” from scanned, faxed, and printed documents. Are you getting the most out of your SAP investment? Find out now. Our experts have all the answers!